Yeh Rishta Kya Kehlata Hai 31st October 2016: Naira cried as she could not stop Kartik. Nunu and she then left from airport. Kartik did not get his boarding pass. Kartik asked taxi driver to get him to the nearby hotel as he would board the flight in the morning. Kartik asked him to stop at peer baba. Naira car too passed from there and she too went there. Kartik prayed at dargha. Naira too cried and prayed. Kartik and Naira passed by each other many times but did not see each other. Naira left from there but her foot got hurt when she was leaving. She came back home. Devyaani asked as how she got hurt. She told her that she was given punishment for some mistake. Baisa said that she might have done something wrong. 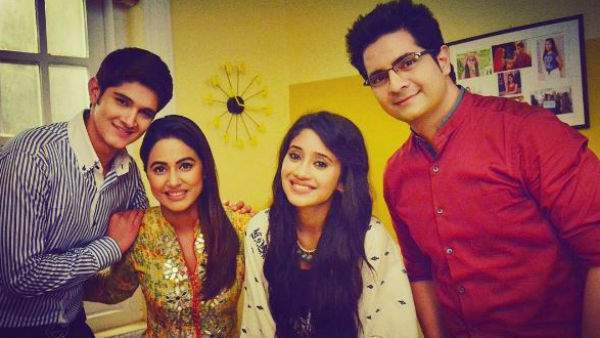 Check: Yeh Rishta Kya Kahlata Hai 28th October 2016. Rama asked Gayu to have food by looking at Kartik’s photo. Gayu was shocked and asked her as how she knew that. Rama said that she could have got his proposal instead of Vivan if she would have told her earlier. Gayu cried and hugged her and asked if she liked Kartik. Rama told her that he was a nice guy but asked him if she tried to know whether he loved her or not. Naira heard them and cried. Baisa said to Devyaani that girls should adjust everywhere. She said that Akshara was not wrong. Devyaani said that Naira was not bad and she would change slowly. Baisa said that she loved girls but if they did not stop them then in laws would stop them. Mishti came there and said that she knew that tv show was going there. She said that she too would have switched off tv and watched their show. She cracked some jokes and asked Baisa to not cry and smiled. Mishti again asked Baisa to not cry. Baisa smiled and hugged her. Devyaani said to Naitik that Akshara was stuck between Naira and Baisa. Naitik asked her not to worry as Akshara would handle the things well. Bau ji joked. Devyaani said that he teased her as she did not have maayka. Naitik asked him to leave things that Devyaani disliked. They all laughed. Naira went to Baisa and said sorry to her. She went to Gayu and lied by her side when she was sleeping. She said sorry to her and said that she did not do anything intentionally and she did not know that she too loved Kartik. She said that she trusted her and told her that she loved Kartik. She too wanted to tell the truth that she loved Kartik as well but she had no courage to tell as it would break Gayu. She hugged her and cried.